I am going to be at the Knitted Wit Holiday Market on December 1st from 1-4 with some other fab-tastic vendors, and I’m bringing so.many.samples to sell! Mostly pattern samples and mostly shawls, there are some real gems in my bucket(s) of things to sell. I’m super excited to see some of these pieces get a new home and new life, because they’ve been getting kind of bored being in bins in the closet in my office for the last couple of years. I’ll also have my binder full of pattern postcards, so as you get yarn from Lorajean or from Jen from Hanks in the Hood, you can find the perfect pattern to knit up, as well. 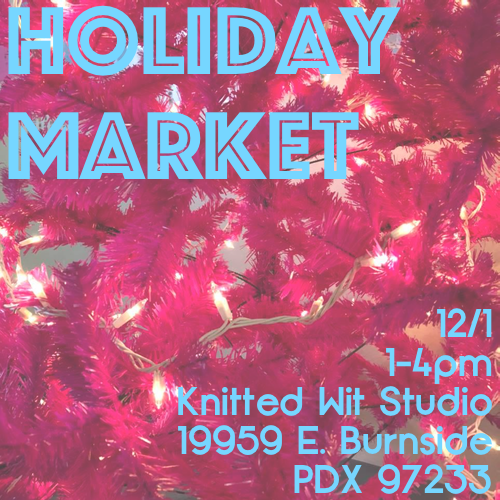 Other awesome vendors that will be there: Chicken Coop Botanicals, JaMpdx, Side Hustle Socks (you can get socks made on their sock machine!! ), Two Amazing Glassmakers, Hanks in the Hood, and, of course, Knitted Wit.